The Golden-collared or Yellow-collared Macaws (Primolius auricollis formerly Propyrrhura auricollis) are small, South American macaws that are part of the mini macaw family. They are also known as Cassin's Macaws, Golden-naped or Yellow-naped Macaws. Their common name was derived from their most notable physical feature - a yellow collar that stretches around the back of the neck. They are closely related to the Blue-headed Mini Macaws (Primolius couloni) and Illiger's Mini Macaw (Primolius maracana). Yellow-collared Macaws occur naturally in central and south-west Brazil; the provinces Beni, Santa Cruz and Tarija in Bolivia; northern Paraguay; and northern Argentina (Southern Jujuy and Northern Salta). They inhabit cerrado and deciduous woodland where they feed on fruit and seeds. The Yellow-collareds are amongst the largest of all mini macaws. From head to tail, they measure about 14.96 - 15.75 inches (38 cm - 40 cm) of which about half are the long tail feathers; and they weigh 8.8 - 9.9 oz (250 - 280 grams). The plumage is mostly green, except for some blue, maroon and yellow markings. They were named for their most notable feature - the yellow collar stretching round the back of the neck; the color of which increases in brightness and width with age. The front and crown is brownish black. The characteristic bare facial skin is white with dark feather tracks below their eyes. Some of the outer wing feathers are bluish, and the upper portion of the tail feathers are green, blue and the bottom half are wine / maroon colored. The legs and feet are pale yellowish. The eyes (irises) are orange. These birds feed on various seeds, nuts, fruits and green food. Most likely, there are some insects in the mix, too, particularly when raising young. They will also visit clay licks, where they ingest mineral-rich clay. This clay offers valuable protection against toxins naturally found in their diet. More information on macaw nutrition and weaning chicks. 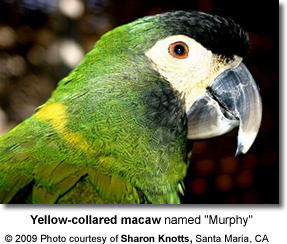 Within their natural range, Yellow-collared Macaws usually breed from October to April. 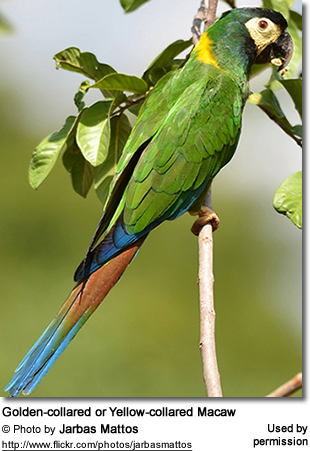 These parrots usually make their nests in the cavities of trees. A clutch consists of 2 - 4 eggs, which are incubated for about a month. Both parents protect and feed the nestlings. The chicks fledge when they are about 3 months old, but they will remain with their parents for some time after fledging.